A gutsy effort from Italy wasn't enough to stop England from powering to their first win of the 6 Nations with a 39-7 victory at The Stoop. Much like last week's game against Ireland, Italy defended bravely in the opening half and lived with England for large parts, even taking the lead after 20 minutes. but England's superior fitness saw them home as they pushed on late in the game. It was a far from accurate first half hour from England whose repeated attacks deep in Italy's half came often to nothing with the Italians defending superbly and England not making possession count. The first real break of the match came from Kay Wilson from fullback and when play was recycled the returning Katy Mclean kicked her side 3-0 ahead. There was some nice interplay from England, with Harriet Millar-Mils combining nicely out wide a few times with the backs along with Tamara Taylor, who was prominent, but Italy's breakdown work was solid and even when Victoria Fleetwood broke into the 22, a clear chance was missed thanks to the Italian effort on the floor. England had a great opportunity shortly after Mclean hooked a penalty wide, but Sara Barratin did brilliantly to hassle Bianca Blackburn and Italy booted it clear from their own try line. 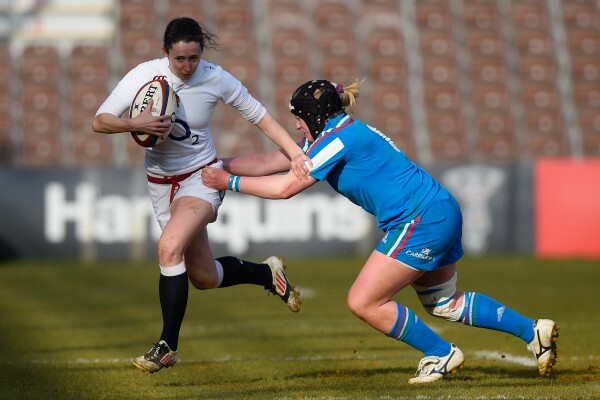 Next it was the visitors turn to score when another turnover saw Manuela Furlan kick deep into England's 22. Blackburn's clearance kick didn't make touch and Italy ambitiously ran it from left to right with Michela Sillari doing well to stay in touch and win a penalty. A quick tap caught England off guard and Flavia Severin hit a great line to crash over. Sillari's conversion made it 7-3 after 25 minutes. England came right back though and Rocky Clarke was held up over the line after a quick tap but finally the good pressure told and Alex Mathews fought her way over the try line with Mclean converting to go 10-7 up. Mclean missed a long range effort soon after but with Matthews coming more and more into the game. England were ending the half on a high when good work up front led to another try from Abbie Scott and a 15-7 lead at the turnaround. England started the second brightly with Ruth Laybourn's pace causing problems and it took a Furlan tackle to stop her racing through and after a series of penalties at the scum in front of the sticks. Italy were down to 14 when Beatrice Rigoni was yellow carded. Italy - under massive pressure - did really well to turnover and clear. Still England came at them though and when the next try came it had a touch of fortune about when a really poor clearance effort fell England's way and Ceri Large took advantage out wide to bundle over after Sarah McKenna had come close. Mclean's extras gave England a 22-7 lead. Mclean was next over for England after a powerful surge at the scrum and her earlier half break. Hannah Gallagher, who is growing into the England number 7 shirt. hit the line of the day for the next try as her clean break and pace took her 30 metres and beyond the desperate tackle of Furlan. Megan Goddard converted to make it 34-7 with just minutes to go. Wilson put the icing on the cake with a final try in the corner. England: Kay Wilson (Thurrock), Ruth Laybourn (Darlington Mowden Park Sharks), Abigail Brown (Bristol), Ceri Large (Worcester), Sydney Gregson (Bristol), Katy Mclean (VC) (Darlington Mowden Park Sharks), Bianca Blackburn (Worcester), Rochelle Clark (Worcester), Victoria Fleetwood (Saracens), Laura Keates (Worcester), Tamara Taylor (Darlington Mowden Park Sharks) (C), Abbie Scott (Darlington Mowden Park Sharks), Aexandra Matthews (Richmond), Hannah Gallagher (Saracens), Harriet Millar-Mills(Waterloo).